Following the success of Italian restaurant Bestia in the burgeoning Downtown Los Angeles Arts District, husband-and-wife team Ori Menashe and Genevieve Gergis have opened Bavel in the same neighbourhood, this time with a focus on Middle Eastern-Mediterranean food. Local outfit Studio UNLTD, together with Gergis, used the bones of an old warehouse to embrace the gritty location and the current popularity of this cuisine: washed bare brick walls, oversized industrial windows and soaring sawtooth skylights provide the canvas for hanging chandelier planters and walls of greenery evoking Moroccan lattice work. 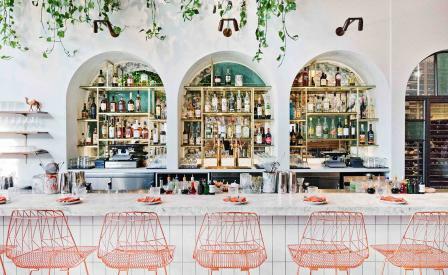 Meanwhile rose gold, turquoise, saffron and tumeric hues are revealed through the custom-made floor tiles by local company Fireclay, lantern-like pedant lights and furnishings such as the upholstered banquettes and the bar stools.